I am in direct contact with Karachi leadership, and I would say it is a mixed bag. There are some really great people in there, but there are parts of it that are very slow to act. I can give them some leeway due to the fact that MQM was a militant group until recently, and things have changed drastically in the last year. But I really think that they need to get a move on, and organize themselves much better. I was thinking that due to the fact IK is standing from Khi this time will create a wave in favor of PTI and the local leadership will show more passion so let's see if they start doing anything on the ground. ALH seems to be active i wasn't expecting him to do anything on ground but he is looking active. Amir Liaqat Hussain is very active, and is rallying a lot of support. I think he will contest from NA-245, and it's looking like a sure win. He is the most active right now. He went to Korangi the other day to meet people too. He is a big asset, but also a big risk too. You never know when he will switch sides again. He can work wonders, but also backfire badly on PTI, huge gamble. In my opinion, it is working out as NA-245 is now looking like a PTI seat. In fact, PTI will probably win all 4 seats in district East. There is a guy whose mother died due to cancer. He struggled, raised money & built two cancer hospitals under her name in #Pakistan. 75% of the patients are financially assisted. Then there is a woman whose mother has lymphoma. She tweets her mother's pics from London. Yeah, PTI got 50,000 votes in the same area as NA-245 was. NA 251, 252, 253, 256 are the four district East seats, now NA 242, 243, 244, 245. PTI will sweep these, all mostly middle class areas with a lot of PTI support. Tickets will be finalized in early May, I think Naz Baloch will probably end up winning her seat as the PPP candidate running against her also got a good 20,000 votes. Yaar dil khush hojai agar Karachi se 5-7 seats jeet jaye PTI. We need nijaat from PPP waderas and MQM gundas. Right now, I don't think ALH, after all he's done, will ever OPPOSE PTI. Wouldn't it be great if Maryam decided to do something similar. I am sure all these Nooras would "trust"them with their money. Come on Nooras tweet Maryam so that she can do something good for PK and you guys can contribute. 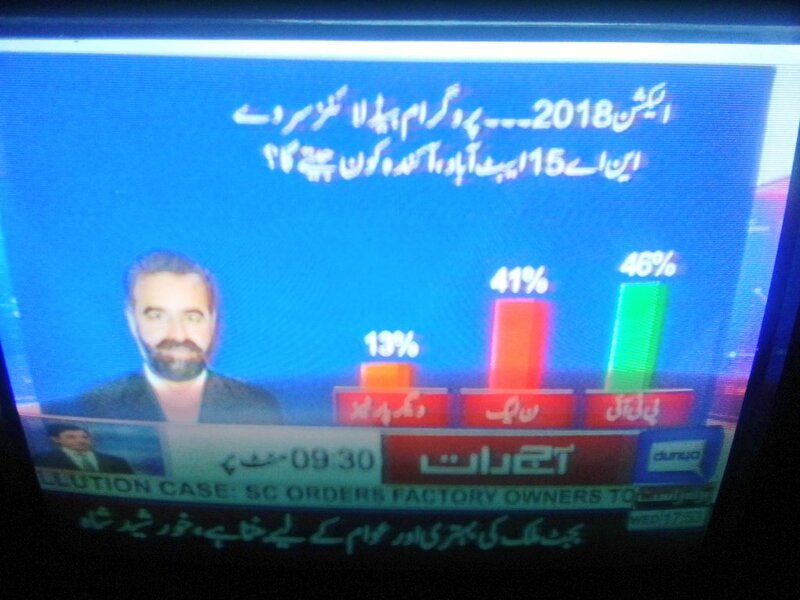 PTI is winning NA-17 Haripur for sure. Haripur is a Hazara district historically known as pro PMLN. PTI is getting strong in Aboottabad and Haripur but they are really weak in Maryam bibi's susral i mean Mansehra district of hazara. On the request of PTI's Dr Arif Alvi the date to register/move your vote is extended from 24th April to 30th April so hurry up guys and do let your family and friend know there is still time we need more and more votes if we really want a change. In 2013 i came to know about many young guys who promoted PTI on social media but never registered their vote and didn't bothered to visit a polling station to vote maybe they were expecting miracles? Motivate others to vote even if they want to vote for other parties it's healthy for our democracy. Heard ALH was attacked today by some MQM goons after his program? All the MQM workers who have switched to PTI are actually in serious danger. A few of the workers who switched last year received a lot of threats from MQM. And we thought MQM's militant wing died? I think 5 is the minimum if we can save Dr Arif Alvi's seat. I personally think PTI could win 8 from Karachi if they work hard enough. Militant wing is dead, they are not armed or anything. But MQM workers are willing to beat people if they have the chance. What is the update on KPK Budget for next year ? IK does not want PTI led gov to announce budget and what is the Line of PTI Law makers in KPK ? How will it impact PTI ? PTI looking strong, enough to win election? Do they have allies for a coalition? PMLN and PPP are obviously not gonna join so who else is there? Most likely that they will form government with PML-Q, BAP, Independents, and some smaller parties. PML-N and PPP may join, but at this stage, they may not even collectively win enough seats. PML-Q, BAP seem to be allies. Would be great if they make some deals with a more Sindhi party like NPP of PML-F.
PTI actually looking very strong in Sargodha now. First they got Nadeem Afzal Chan, and now this development. PML-N should be really scared, because PTI is now infiltrating into Central Punjab too, before they were only really making gains in the South. Good job! The MNA candidate in nankana sahib is going be Ali Salman? The guy he won as MPA ind and joined PTI? Not sure yet, might be a good choice though. Tickets are all being finalised on 4th May. I hope the people who signed that affidavit before applying for ticket will follow it. Wow this is BRILLIANT work bro, helps understand strengths and weaknesses, great thinking!! 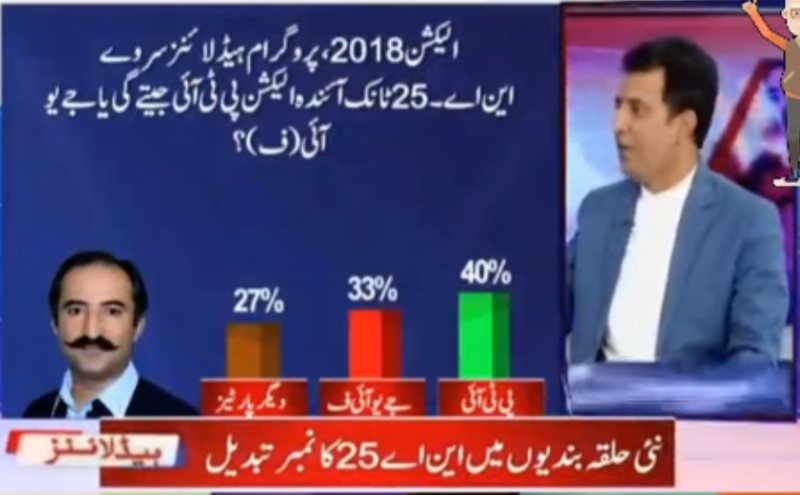 I must say Habib Akram has been acting very neutrally while conducting these surveys, he always had (probably still has) soft corner for Nawaz Sharif but deserves credit for presenting accurate analysis. I really like Ali Salman, have interacted on twitter a few times. He was probably only MPA from Punjab (maybe there was 1 other, can't recall) who joined PTI after winning as Independent. I believe he applied for ticket in same constituency as Bilal Virk who joined form PMLN which makes it really a tough choice but i would give him the ticket purely based on fact that he is young, educated, ideological and electable so should get ticket while we adjust Bilal Virk somewhere else. Yea i also follow him on Twitter he is a hard working guy a lawyer and always working in his constituency. I heard Bilal Virk consistency is gone afetr new halqa bandyan so there is a chance Ali Salman will be given the ticket. Yes love that fact! Add to the list Usman Saeed Basra and Hasan Niazi (Imran's nephew). These are only the ones currently active on social media otherwise there are several others. oh yea how he forgot to mention Hassan Niazi he is very active these days. Is he the son of Hafeez Niazi? Some bold words from chan in his yesterday speech. Khan sahab aap ticket dae na dae humari family kheri hogi ap ke sath. Reports of Fehmida Mirza and Zulfiqar Mirza joining PTI in coming weeks if that happens 1 NA seat from Interior Sindh is confirmed. @Mian, which is that prized wicket? Which team he belongs to? So, he took wicket on a no ball? Or Shehbaz bowled him already in previous over? That is brilliant! I think PTI are also pretty much confirmed on one of Umerkot and Tharparkar, and they have a real chance in Dadu because an electable joined from there a long time back (Liaqat Ali Jatoi). If i am not wrong Sherazis, Arbab Rahim and Meher (both ex CMs) are also in talk with PTI? There were reports floating around not too long ago, let's see what becomes of it. PTI have actually done a brilliant job of educating and making the people aware of how other parties have been fooling them for decades. I think PTI have sucessfully created an ideology based thinking in KPK, which is what his overall aim is for all of Pakistan. Contrary to common belief, PTI is actually stronger in Rural Constituencies across Punjab. Reliable source. Wow PTI is more popular in Abbotabad Hazara now than PMLN and current MNA from there is of PMLN and he is deputy speaker in NA. It looks difficult for PML N to win more than 60 seats. Do you guys think that Ch. Nisar will join PTI? Looks more and more unlikely now. Thats good! I remember on his orders there was firing all night on IK, PTI leadership and PTI supporters during the dharna. From todays interview with Hamid Mir on Geo News. The other day I was thinking, instead of joining PTI why doesn't Chaudry Nisar join with Shiekh Rashid in the Awami Muslim League. They both will rule over Pindi and can easily nab 2-3 NA seats. I have a feeling this interview was conducted BEFORE the na-ehli and now the divide might be like 46-52 in favour of PTI. Habib Akram is really doing a service to the nation by going to every big and small city and guaging political temp, I used to take him for a lifafa journalist and actively avoided any show he was on, but credit where credit due. Also if PTI has gained this much ground even before election campaigning then they can actually win this seat if they put time and effort. I like Usman Dar, he is a capable young guy and possibly a future important leader of PTI in post-Imran era. I'm a big fan of Sialkoti people, I've only met two or three in my life but all of them displayed that same enterprising personality trait that is abundant in Sialkot - which is why the city has been able to stand up on her own feet without much assistance from government. Last I heard he was going to get MPA ticket and not MNA ticket. He is popular amongst the middle and upper middle class folks. The bulk of the voter base which comprises of the poor may not be aware of his existence. He can definitely win his seat though. If there was one guy who I would want to be Karachi mayor its this guy, when he can do this much effort without government support imagine what he can do when he has the government machinery to back him. Talking about Skt, What gunda-gardi and Bhatta-mafia show happened in days leading to marriage of Khawaja's Son, right from Vintage movie dons' books. Na-ehl Khawaja bulldozed an under construction plaza when the owner refused jagga tax. Without Khawaja, not much for PMLn in Skt. Besides Dar, for PTI, Akmal/Ajmal Cheema brothers are also electables. And also, couple of PMLn MPAs are in trouble courtesy NAB cases against family members. PTI Sialkot team has done good ground work because office holders,barring few, are the ones who have been with PTI since early 2000s and they bond well together. 2 of them are sure wins (Usman Dar and Firdous Ashiq Awan), the other 3 look difficult. PTI did not get even half of PML-N's votes in any of the other 3, and I don't think we have any strong candidates there either. PTI has recovered well in Khawaja Asif's constituency. I can see more and more people finally speaking up against Sharifs and their corruption, if it becomes a bigger issue then PMLN will stand no chance. More ex-MPAs from Punjab joining PTI Two from Faisalabad, one from Chiniot, one from Toba Tek Singh.